Rin is the mysterious shopkeeper of the Yume Kira Dream Shoppe, a magical storefront shop which flies through the sky at dusk. With a store filled with unusual and rare items, Rin listens for wishes that travel on the wind and, aided by an assistant named Alpha, offers magical wares to grant these wishes at the cost of something dear to the customer. 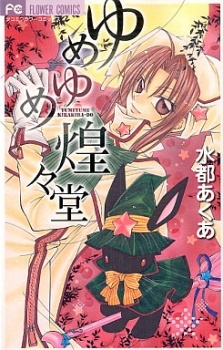 Yumeyume Kirakiradou was published in English as Yume Kira Dream Shoppe by VIZ Media under the Shojo Beat imprint on September 4, 2007. An anthology of shojo stories, it revolves around the idea of the YumeKira Dream Shoppe. It makes great use of the idea of "wishes coming true". The first story focuses the wish of being human, the second: the ability to talk, the third: turning back time, and the fourth: changing yourself. A sweet-collection of pure-love stories that introduces fresh, relatable characters in every day settings. Intended for girls, the content is mainly unrealistic yet attractive and adorable nonetheless. Not the most well-thought out thought, but enjoyable to the last page. If you ever thought of a wish for true love, you'll relate to this story. It's like cotton-candy to shojo manga! I heard about this manga while reading Aishiteruze Baby. At first I thought it was just another manga but then when I read those stories I felt joy from them and sometimes sadness. It may have been short but it was amazing. I wish the author made more because that would have been wonderful. But I have one question. Is Rin a boy or a girl I'm thinking girl because Rin from Vocaloid is a girl but I was havin second thoughts. Anyway you really should read this if you haven't.